✓ Ratios of the sides in a right triangle with respect to some acute angles are called trigonometry ratios for specific angles. 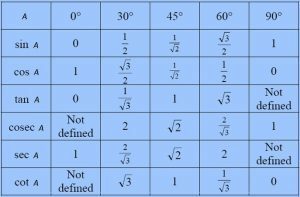 ✓ The angles 0°, 30°, 45°, 60°, 90° are useful angles in trigonometry. ✓ Trigonometric ratios of angles help in simplifying problems.